Teens looking for a summer job should plan on heading to Soldier Field this weekend. 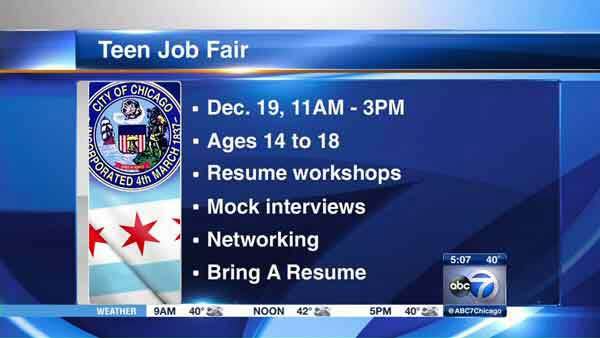 CHICAGO (WLS) -- Teens looking for a summer job should plan on heading to Soldier Field this weekend. The Chicago Park District and Mayor Rahm Emanuel will hold a job fair in the Stadium Club Ballroom from 11 a.m. - 3 p.m. Saturday. The event is aimed at teens aged 14-18. Job hopefuls should bring a resume. The mayor's office said there will be resume workshops, mock interviews and networking opportunities. Attire for the job fair is business casual. Kendra G of WGCI will host the "Career Ready Fashion Show," which showcases do's and don'ts of what to wear at work. CLICK HERE to register for the job fair. Attendees should enter Soldier Field through Gate #6, on the east side of the stadium. Gate #14 is ADA accessible. Parking is free in the Waldron Lot, which is south of the stadium. For more information, visit www.ChicagoParkDistrict.com or call (312) 742-7529.